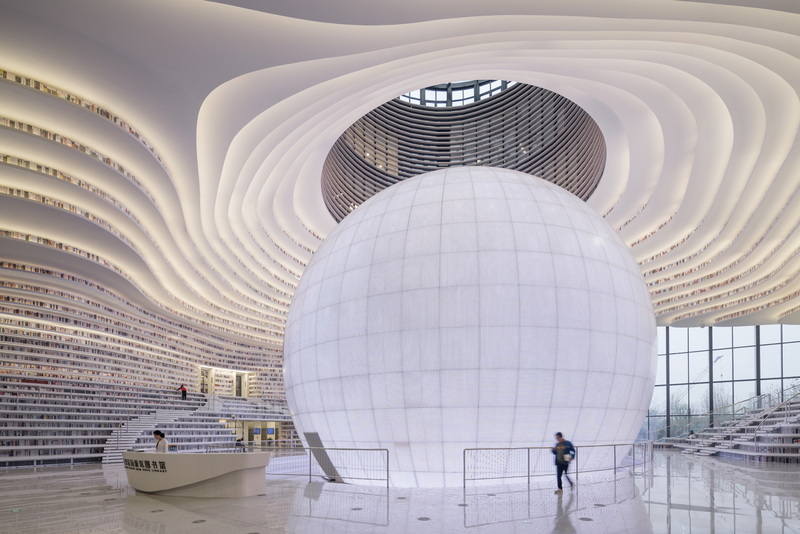 The new Tianjin Binhai Library in Tianjin, in the district of Binhai, has been all over the media since it opened early in October of 2017. 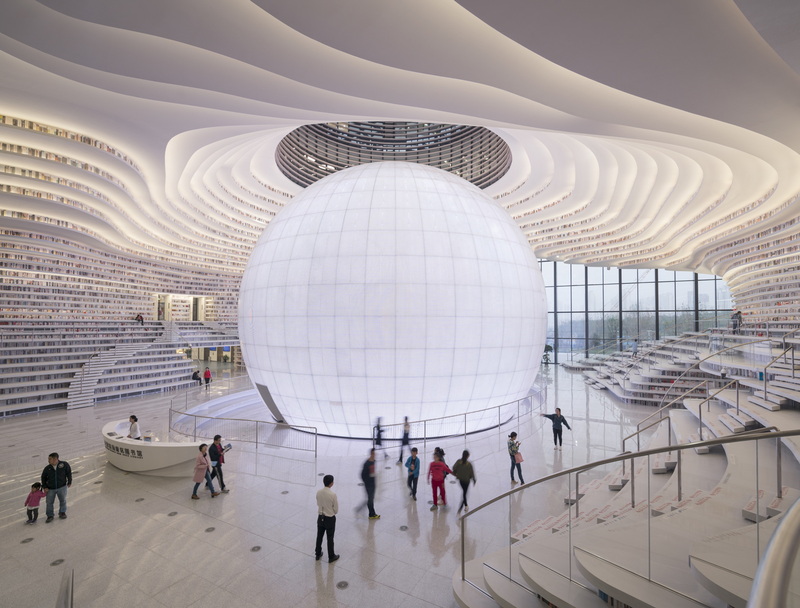 The Chinese social media describe MVRDV’s project as a "sea of knowledge", or “the Eye”, while Bund has called it “China’s most beautiful library”. The easiest descriptions use metaphorical images alluding to a structure with elusive boundaries, made up of levels running along overlapping curved lines offset in relation to one another. It brings to mind the depths of the sea, or the slopes of the land; in either case, a space that closes in on itself. In actual fact the inside of the library is a big empty space around which a landscape of books has been built, a structure defined in terms of horizontal planes, the shelving, overlooking a physical and conceptual centre. This “pearl in the oyster” or “pupil in the eye” is a big sphere of light which is intentionally given an aura of mystery, and which actually contains an auditorium. Winy Maas, co-founder of MVRDV, says that as the architects could not touch the outside block of the building, they “rolled up” the auditorium the programme required into a ball and put it in the middle of the building. 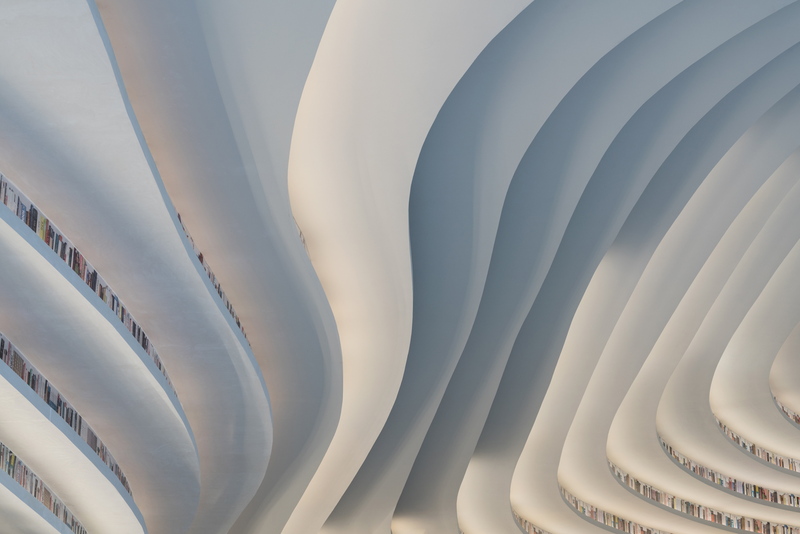 Its luminous structure defines it as an energetic space, from which symbolic forces irradiate, forming the empty space around it and its confines, defined by the curves of the shelves. The metaphor continues in the construction of the relationship between the inside and the outside of the library. 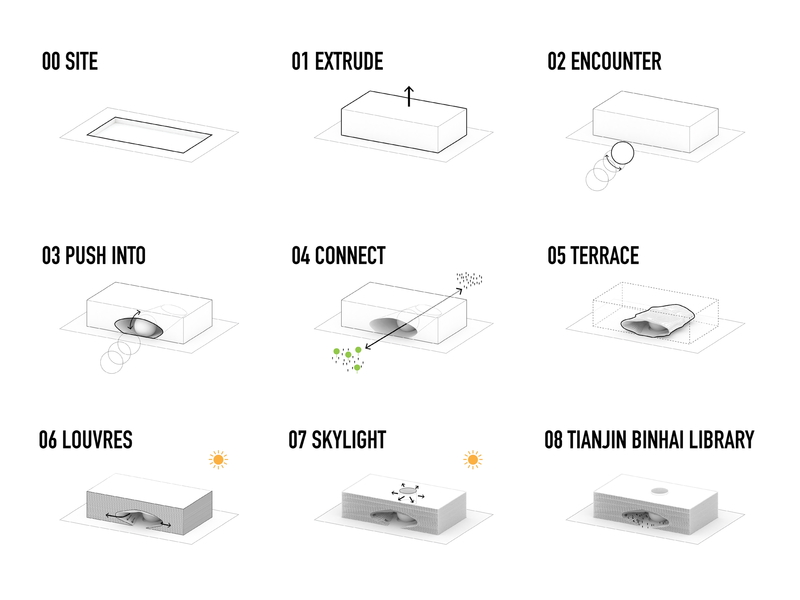 The architects of MVRDV had fun representing the volume as a big solid box which is suddenly hit by a sphere passing through it at ground level, making a huge hole in it. This hole is in actual fact the passageway from one side to the other, linking the two doors of the library around it. The bookshelves fill in the entire distance between the floor and the ceiling of the big atrium, and can also become stairs and seats when necessary. Places for reading and interaction blend together, and each level can be used for reading, but also for thinking, chatting, or meeting people, informally and with no clear distinction between functions. MVRDV’s library, built in collaboration with the urban planning and architecture institute of Tianjin (TUPDI), is just one of the buildings in a 120,000 square metre masterplan designed by GMP including contributions by other international studios such as Bernard Tschumi Architects, Bing Thom Architects and HH Design. The intention is to create an urban space culturally connecting the old city of Tianjin with the residential districts, shopping areas and government district. 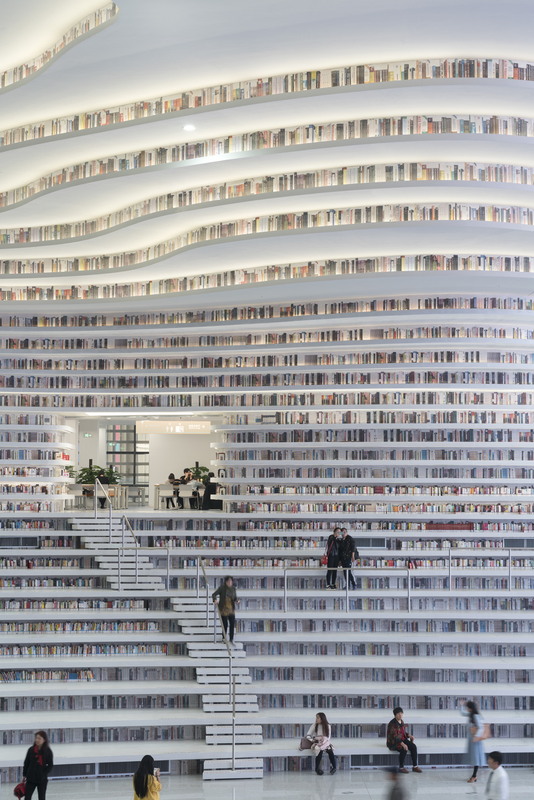 Though MVRDV was very much against it, the rigid construction schedule imposed by the municipality of Tianjin, the client commissioning the project, meant that the library had to be inaugurated when a part of it was still missing: the access to the top shelves in the rooms right above the atrium. The top shelves have been completed with aluminium sheeting with printed images of the books intended to be physically present and consultable in the architects’ design, as it is not certain that they will actually be built in the future.